An in-depth look at the worst rated game ever, and explaining that it’s definitely, absolutely, totally not the worst game ever. 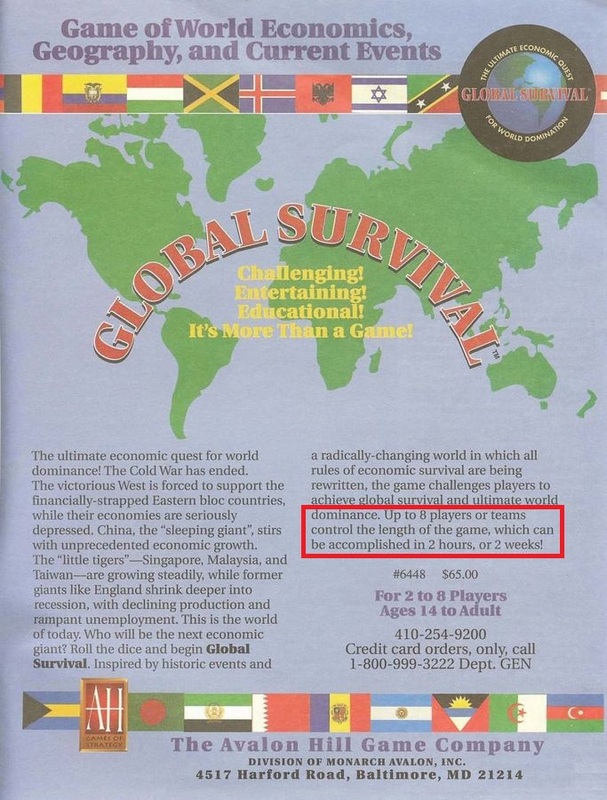 Today we’ll be taking a look at Global Survival, a game produced by Avalon Hill back in 1992. On the surface, Global Survival seems like a perfectly innocuous game. It’s really only when you start playing that how great it is starts to show. And by “show”, I mean slap you in the face with amazingness and how un-cluttered everything is. The game is currently the lowest ranked game on BoardGameGeek. It has a 1.8 rating. This is an outrage. The world needs to understand this game is a masterpiece. Today we are going to explain why everyone but me is wrong. At first glance, the game might seem like Monopoly, but it’s totally different in a lot of ways. Let’s go over how. 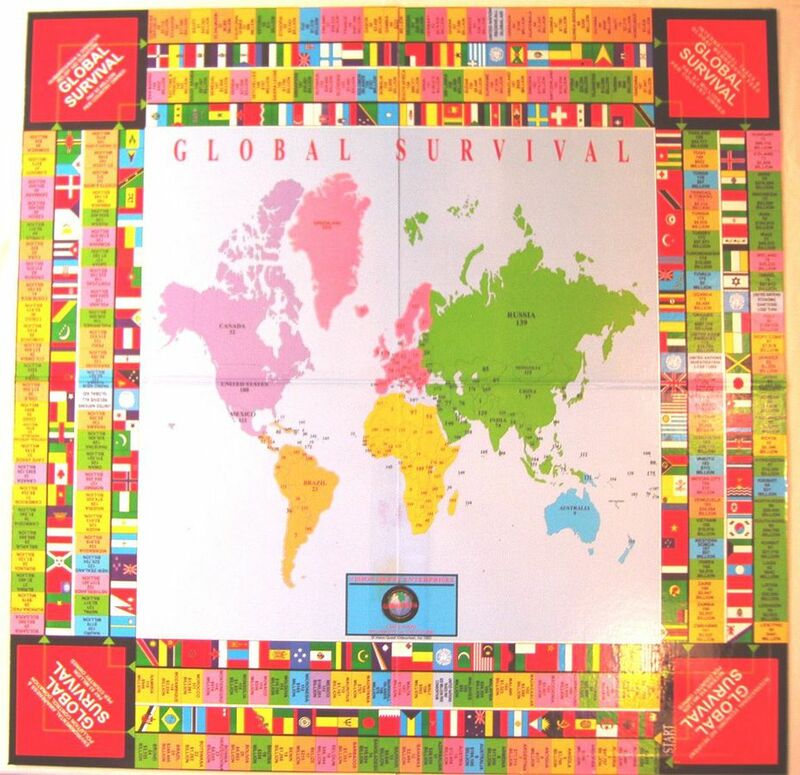 So, Global Survival plays on a square board. Each player starts at the corner of the board and moves around the edge of the board by rolling dice. You might be looking at this board and thinking to yourself, “But this is just like Monopoly”. And to that I say, “No! It’s nothing like that!”. Monopoly only has one path around the game board, which is boring and lame. Global Survival ups the excitement by adding two paths around the board. One of the corners on the board has the player’s pawns move from the inside path to the outside and vice versa. It’s definitely not needlessly more complicated and adds nothing except more clutter to the board. Anyone who thinks that is objectively wrong. Similarly to the board being clear and simply defined, the pawns and dice used within the game are obvious in their usage. And because it’s so obvious, I won’t bother wasting your time explaining how each die is used. Once again, Global Survival takes what Monopoly has previously done and does it better, faster and sexier. When a player lands on a space, they have the option to purchase that country. 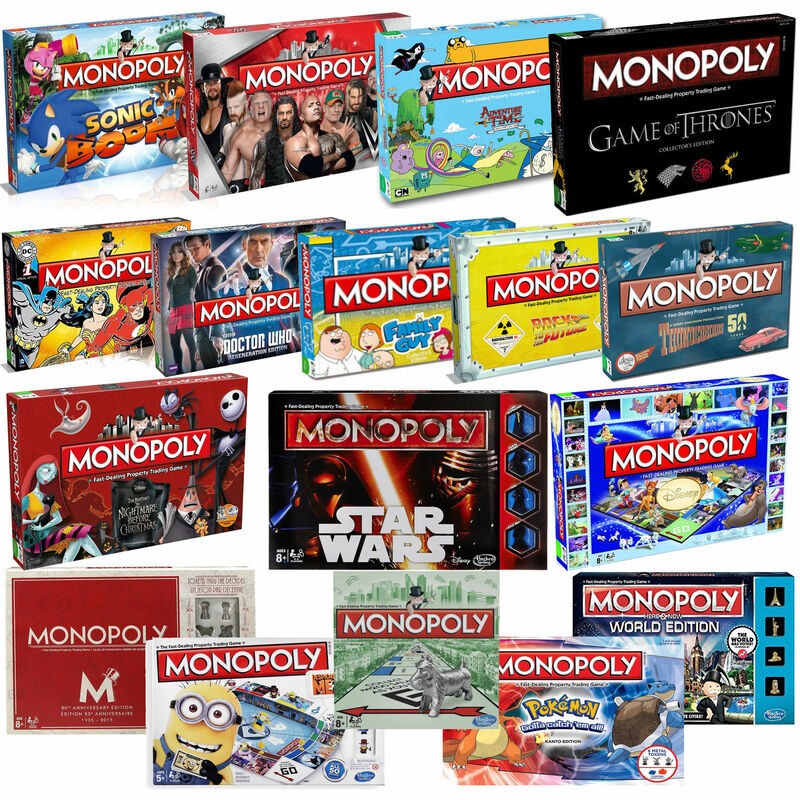 That is very different from how Monopoly typically works, where you buy up properties in Atlantic City, or Mobius, The Land of Ooo, Westeros, Gotham, Gallifrey, Quahog, Hill Valley, Halloweentown, Tattoine, The Magic Kingdom, or the Kanto Region. 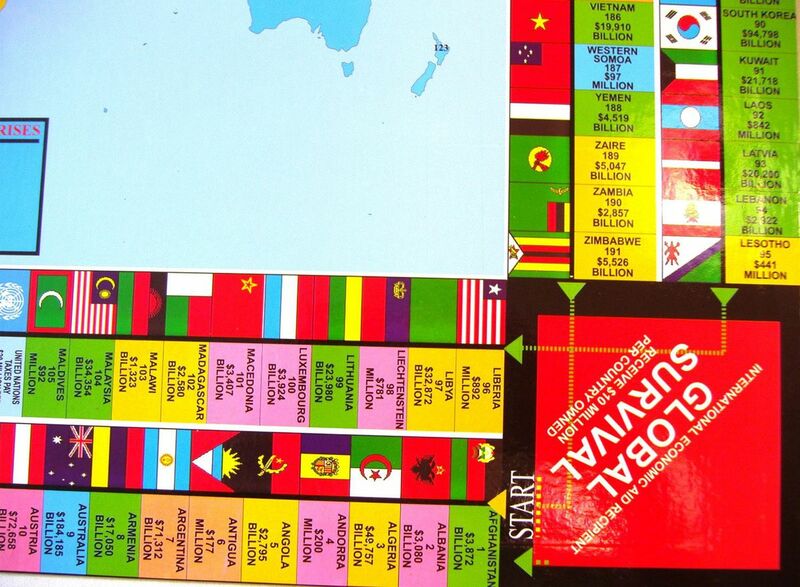 The game comes with country cards to explain everything you might need to know about the country. Is all this information necessary to play the game? Of course not, but that’s what makes Global Survival unique. Global Survival gives you more than you ever asked for or wanted in a game. Sure, you could play boring old Monopoly set in Atlantic City and read over each property card. But is that going to tell you to check out Dock’s Oyster House on Atlantic Ave? No, because Monopoly doesn’t give you any background to the properties. There’s no way to really feel like you’ve invested in these properties. 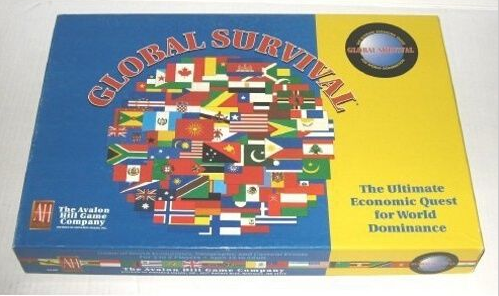 Fortunately, Global Survival tells you every minute piece of information about the country you’re buying up. 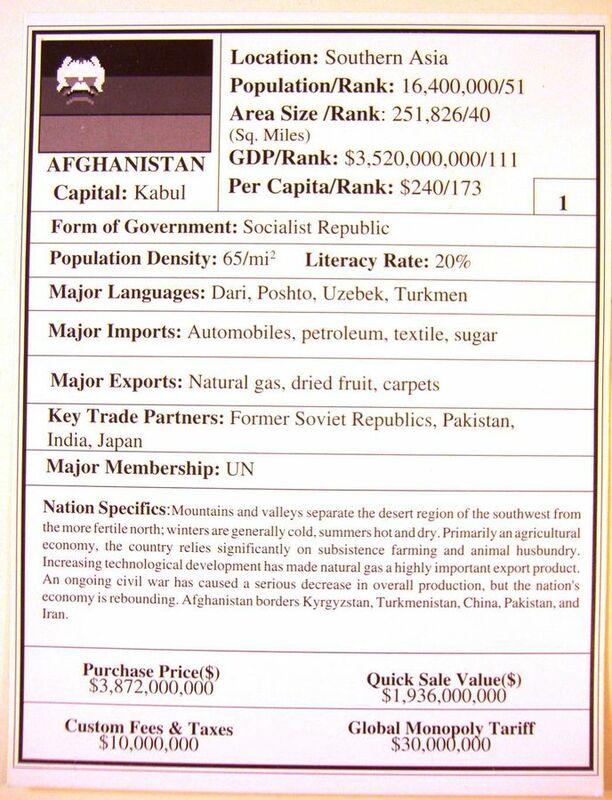 Maybe you’re unsure about the socioeconomic standing of Pakistan and will avoid buying Afghanistan knowing that they are key trade partners. Again, Global Survival has you covered. Finally and certainly the most important: Money. In Monopoly, you begin the game with a paltry and meager $1,500. BORING! That kinda cash ain’t nothin’ in Global Survival! 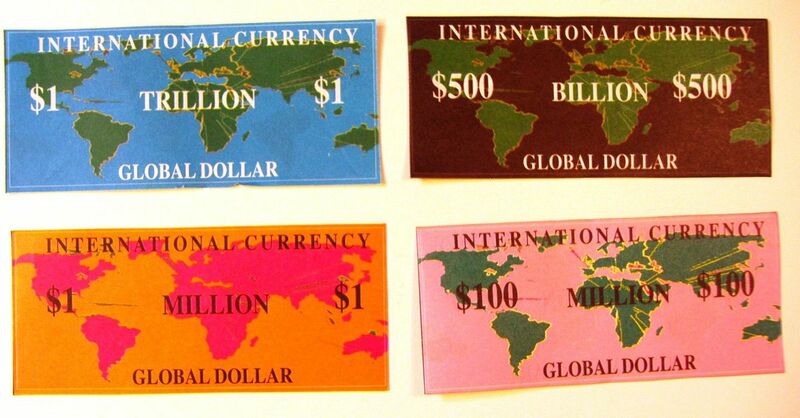 In Global Survival, you start with $200,000,000,000! Two hundred billion dollars! Having that kinda cash is great! It’s great because when you land on another player’s country you have to give them usually around $10 million. But when you start the game with $200 billion, spending $10M is insignificant. Global Survival knows the worst part of Monopoly is running out of money, so they made sure that you never run out ever. This ensures that the chances of a player getting eliminated from running out of money is very low. In fact, the back of he box even says that the players have full control of how long the game will play! Giving the power to the players! On top of that, because the game board has 250 spaces, there’s basically no chance of you actually landing on an opponent’s space. So you don’t even really have to worry about spending any money at all. The only time you will have to spend money is during the game’s random events. Each time a player lands on a new space they check an events book. The game doesn’t want you to worry about needing to roll well or make the right choices. So these events will give and take money from the player without them having any say in the matter. But, rest assured, the amounts gained and lost are also insignificant so it won’t affect the game at all. ~Thanks for reading! Next time we’ll discuss the unfair travesty of the rating of Tic-Tac-Toe.